352 pages | 70 B/W Illus. Disaster health is an emerging field that focuses on developing prevention, preparation, response and recovery systems for dealing with health problems that result from a disaster. As disasters worldwide differ in their nature, scope and cultural context, a thorough understanding of the fundamental tenets of sound disaster health management is essential for both students and practitioners to participate confidently and effectively in the field. The strategic considerations associated with leadership, research, education and future directions. 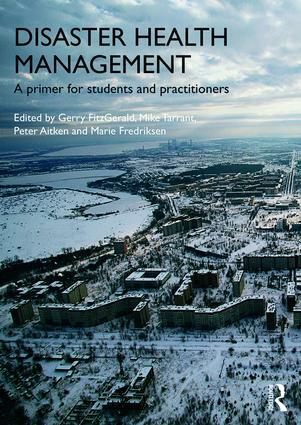 Using Australasian systems and structures as examples of generic principles which will find application globally, Disaster Health Management is an essential text for both undergraduate and postgraduate students, as well as for professionals involved in all aspects of disaster management. Gerry FitzGerald is Professor of Public Health in the Faculty of Health at Queensland University of Technology (QUT), Australia, and Director of the Centre for Emergency and Disaster Management. Mike Tarrant holds adjunct appointments including Associate Professor in the Faculty of Health at QUT and in the Department of Tropical Medicine at James Cook University, Townsville, Australia. Peter Aitken is an Associate Professor in the School of Public Health, Tropical Medicine and Rehabilitation Sciences at James Cook University, Australia. Marie Fredriksen is Lecturer in the Faculty of Health at QUT and a Paramedic with the Queensland Ambulance Service, Australia.